Crusaders will play Slovenian side Olimpija Ljubljana in the second round of the Europa League qualifiers. 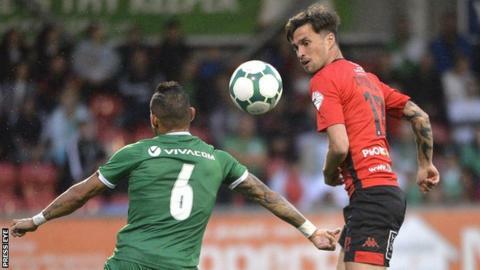 The Irish Premiership champions crashed out of qualifying for the Champions League after a 9-0 aggregate defeat by Ludogorets Razgrad. Olimpija were beaten 1-0 on aggregate by FK Qarabag of Azerbaijan. The north Belfast club will travel to Slovenia for the first leg on Thursday, 26 July with the return match at Seaview on 2 August. Olimpija lost the first-leg of their tie against Qarabag 1-0 in Ljubljana and they were reduced to 10 men in the closing stages of a scoreless return leg in Baku where the Azerbaijani champions held out for an aggregate victory. Stephen Baxter's side will earn a minimum of £700,000 from their European campaign this season even if they fail to win a single match but the club will now be hoping to advance to the third round of qualifying for the Europa League following the club's ambitious decision to move to full-time training. Olimpija, who narrowly beat Maribor to win their second Slovenian PrvaLiga title last season, have won just one of their last six European fixtures. Crusaders will be without their record goalscorer Jordan Owens for the two-leg tie after the striker suffered a hamstring injury during the defeat by Ludogorets.